Kundalini Yoga, the Yoga of Awareness. Yoga has been a part of my life for 14 years. When I was in my mid-twenties, my friend Allyson invited me to my first yoga class. I wasn’t particularly athletic or health conscious at the time but that first class would make a lasting impression. We went to Goldenbridge yoga in Los Angeles, located in West Hollywood, and practiced Kundalini yoga. I didn’t know anything about yoga at all and had no basis for comparison. I went to the class with an open mind and sense of curiosity. I believe that proof is in the pudding, and I felt amazing after this class. We had our eyes closed through most of the class, so there was no way to look around or feel self conscious about what we were doing. 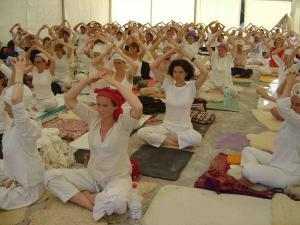 Kundalini yoga focuses a lot on breathing and doing yoga from the inside. This particular class had a lot of chants and mantras in Sanskrit, and I had no idea what I was saying. I began to realize that it didn’t matter. What I was doing and feeling transcended any type of language. By focusing on our breath, we were able to give ourselves a natural high. I bet you don’t realize it, but we go through a lot of the day holding our breath. We’re busy and focused at work all day, taking shallow breaths. And even when we do take a deep breath, we only fill our lungs and not our stomachs. Try it now: take a deep breath and hold it. Then take in a bit more and focus on filling your stomach too. That’s a deep breath! My favorite thing to do in Kundalini yoga is called breath of fire. It consists of many deep breaths in and out of the nose focusing on the belly done at a rapid pace. It may look and sound weird, but you can feel a difference after just 1 minute. The idea is to awaken the chakras and move the energy from the base of the spine to the crown of your head. Our most important tool sits at the top: the brain. At the end there was a gong meditation. The yogis believe that sound aids meditation. To this day, those were the best meditations I’ve ever had. The instructor would say, “Just close your eyes and watch the picture show.” Wow, was it amazing! This particular class spoke to me, and I found myself going every Sunday at 5pm with or without Allyson. Yoga taught me to be more health conscious. I naturally became a much healthier eater after practicing yoga because it was difficult to get through a class after eating a heavy meal earlier in the day or even the night before. I found that I did better in the class when I ate lighter. 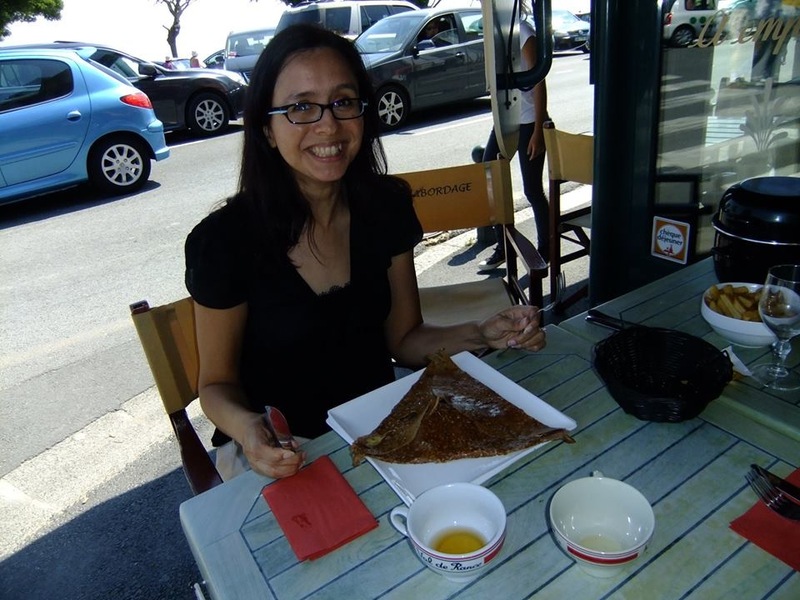 Monique Gonzales prepares to dive into a big galette (what we call crèpes in America) at a cafe in Cancale, France. Another important thing yoga taught me is the power to self-heal. Realizing that we all hold this power is truly enlightening. Although we can’t control what goes on around us, we can control how we react. Yoga has helped me clear my head and remain calm in many situations. It has eliminated a lot of stress in my life, and I am grateful for my practice. Monique Gonzales practices yoga with her husband Julien on a weekly basis. She has lived in Hawaii and France but always finds herself returning to her native California. Editor’s note: Monique is my cousin — the youngest daughter of my late Aunt Ramona (my mom’s sister) and godfather Edward “Pro” Gonzales. I suspect she speaks French better than I speak Spanish. This entry was tagged exercise, health, monique gonzales, voa 4.0, yoga. Bookmark the permalink. I had hoped reading Lori’s post about her yoga practice a year ago would inspire me to begin my own practice, but sadly it did not. Now I will be hopeful that your post about your yoga practice will be my inspiration … it’s a lovely piece and helps me feel the serenity. Thank you! Your description of your experience with yoga almost seems religious. I suppose in the East, “religions” tend to be more a way of life or living than in the West. Would be interesting to know how yoga blends into your personal religious beliefs. You’re so right: there is no competition in yoga, and that’s one of the reasons this sports’ girl digs it. It is refreshing to be doing something for the mind and body that isn’t being timed or pointed. The breath of fire makes me feel ridiculous in a rude sense, but I love gonging. Cheers to tomato galettes! Now you made me hungry for one! Just lovely! I’ve had the opportunity to take a few Kundalini yoga classes from a dear friend of mine and I’ve never felt so completely “put back together” after leaving any class as I had after those classes. Thanks for the reminder to seek it out again.